Learn to surf with Solscape and ride the famous waves of Raglan! 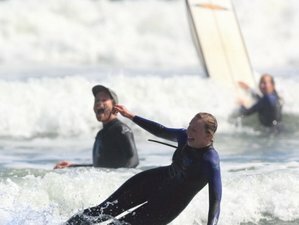 Solscape invites you to join them at their renowned westcoast eco surf retreat, where you will learn to surf in a three-day surf package with a professional instructor guiding you along your journey. Spend your time out of the surf soaking up and exploring the beauty of Raglan at the foot of Mount Karioi and enjoy the breathtaking views of the Tasman Sea. Yoga classes and massage treatments are also available onsite. Solscape is dedicated to creating working models of sustainable living, providing comfortable eco-lodgings whilst being a hub for sharing knowledge that may assist self-development and the protection of the natural world. You will stay in a triple caboose at Solscape. There are 12 authentic New Zealand railway cabooses upcycled into cozy accommodation for a good night sleep. The cabooses are set among Solscape's spacious grounds at the foot of Mount Karioi for a unique experience. The beds are made up with quality linen, duvet, and pillows. Caboose guests share the communal facilities including bathrooms, well-equipped kitchen, indoor and outdoor dining areas, lounge with wood fire, and spacious grounds. Tom grew up in Wellington, New Zealand and caught the surfing bug despite the windy, poor quality waves on offer. It made him hungry and happy to surf in any type of waves and keen to get out and find waves around the world. After traveling and creating a life following the swells and the weather, Tom finds himself back in Raglan, a truly special place with consistent, high-quality waves and a fun and funky town to boot. This surf camp will take place in Raglan, New Zealand. Raglan is an environmentally conscious and artful community full of fantastic people set in an exquisite adventure playground. A short walk from the world famous surf of Manu Bay and Ngarunui Beach, Solscape is nestled on 10 acres at the foot of Mount Karioi with breathtaking views over the Tasman Sea in the magical Raglan. From late November until late May Solscape's ever-popular seasonal plant-based cafe 'The Conscious Kitchen', located onsite, offers delicious and nutritious breakfasts, lunches, snacks and drinks. During the cafe's open season food options will be available to you, at additional cost to your surf package fee. No pre-booking of meals required. Designed for rejuvenation and inspiration to nurture relationships with each other and natural world, Solscape offers surf school and yoga courses and workshops.